Congrats to JacktheRipper for the winning entry and 50 duck prize. Thanks to everyone who entered and voted! Here are the final results of the Caption this drawing caption contest. "The Book of Revelations as told by Michael Bay"
This made me convert to christianity. Mythbusters: So, where did we go wrong? Pacific Rim 2: Holy Mackerel! Go home, Jesus, you're drunk. "This is a joke about economics, isn't it?" Jamie, something has gone wrong. We're dead. SyFy Original: Where Is You God Now? And on the eighth day, God was exhausted! DC has officially jumpstarted the shark. SUNDAY, SUNDAY!! I-Am-Robot V.S. Jawsus!! The new workers in God's office. 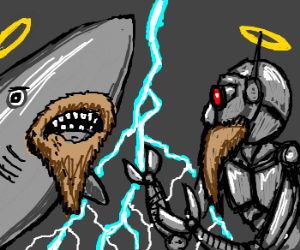 Shark Jesus Vs Cyborg Jesus: Thundering Clash! Everybody has beards, even sharks! "Do you think we're cool enough yet?" By the power invested in me, I'll kill you! Shark Jesus vs Robot Jesus! Ready... FIGHT! Robo-Jesus and Shark-Jesus. Only on PPV. The plot of the next film by "The Asylum"
Shark Jesus smites Holy Clamper. Mustachioed SharkJesus stares down RoboJesus. Robot mythbuster's shark-bot looks like him! Jesus shark VS Robot Jesus! FIGHT! Sharksus Christ vs Botssiah - Round 1 FIGHT!